A while back Animal Planet ran a special, Beasts of the Bible, and I learned something very, very interesting. This is actually quite major in our world of astrological symbolism and I don’t know how we’ve overlooked it for so long. The Bible makes reference to the cherubim, the 8-eyed, 4-faced creature that we typically think of as the four fixed signs of the zodiac ~ bull, lion, man, and eagle. Well! It turns out that “eagle” was a mistranslation by the Europeans. The original bird depicted in the symbolism of the cherubim was a Nesher (Ruppell’s Griffin), the highest flying bird on record soaring to heights of 37,000+ feet. The Europeans weren’t familiar with this bird and translated to the best of their ability with the word “eagle,” the highest flying bird they knew. The reason this is of major importance to our astrological symbolism is because the Nesher is not an eagle ~ it’s a vulture. That changes everything we’ve taken for granted about the depiction of the four fixed signs of the zodiac. Suddenly the pieces are in place. I don’t know how we give up our eagle as the highest representation of Scorpio. One thing Scorpio does, though, is dig down to pick the bones of the truth ~ and they’ll keep picking until they find what they’re looking for. If you’ve got a prominent Pluto or lots of planets in Scorpio, you know exactly what I mean. And the Nesher is still the highest flying bird on earth. From the depths to the heights, Scorpio is still Scorpio. What Bones Do You Need to Pick, What Messes to Clean Up? This is the gift that Vulture holds for us: the cleaning up of messes. Many times we create physical and psychic messes which we then don’t want to deal with. The Vulture can guide us to the efficient and joyful resolution of such problems. What messes can you clean up now? Vultures remind us change is inevitable. It is time to release the past by tearing down the old so that the new can be born. When we recognize and work with that cycle, we waste little energy and effort. How can you save time and energy by cleaning up something? 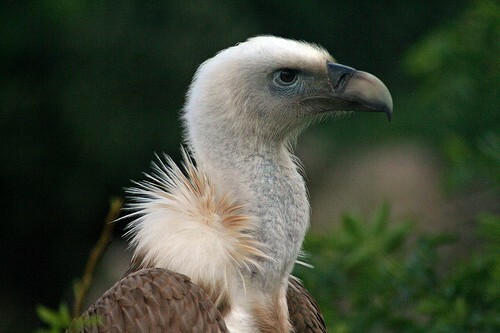 Avia Venfica has an indepth article, Bird Symbolism of the Vulture, on her site, What’s Your Sign. To learn more about the Nesher, check out The Wonder of Birds. Photo Credit: Griffin Vulture by martinbuck119 at Flickr. You are part of that Invisible Wisdom, Great Insights !!! well, if it’s any consolation, eagles are scavengers too! the vulture makes more sense in relation to Scorpio. Interesting information. As one with the Moon conjunct Neptune in Scorpio, I’ll be thinking about that for a while! CJ, this is so right … thanks for this post. Synchronistically, I attended a group healing ceremony for the Gulf region suffering with the oil spill last night — talk about cleaning up messes! I’ve got a Moon-Pluto conjunction, and reading this felt like one more piece slipping into place. Wonderful. I agree with Mary Pat, one more piece slipping into place for this Scorpio! Yep! I have to say that I love the quote on your blog by Edward Munch. So Scorpio, so perfect, and very beautiful.